Forno500 commissioned Mr Ferrera to fly from Naples with his team of Artisans to build his very first Neapolitan fixed oven in Dublin, using old world Neapolitan techniques. He first started building ovens for his local pizzerias with his grandfather when he was just 13 years old and we are proud to host such craftsmanship in Dublin creating the same oaky char that can be found in the best street pizzerias of Naples. Be it beautiful Neapolitan pizza or fresh Wicklow farm pasta. 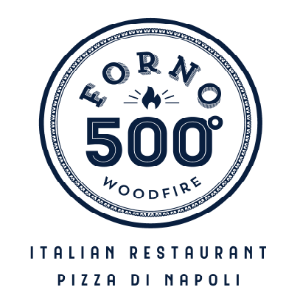 Forno500 is happiness on a plate. Made a reservation but the restaurant was not open. Always a great place to eat and enjoy the good atmosphere. Staff are very professional and very friendly. Great food - great place. Thankful for the attention of your staff! The Pizza was great and service was good too! Fantastic pizza and wine. Quick, friendly service. Pizzas here are delicious. The staff are extremely friendly and go out of their way to make your time here a complete pleasure. Lovely pizzas but the best bit of the meal was the carpaccio. Best one I've tasted! So lovely. All 5 of us enjoyed everything, a great mix of starters, mains and pizzas. Everyone left totally satisfied! The staff were lovely and friendly and the food was gorgeous. Lovely Pizzas , quick and friendly service. Perfect for pre theatre show at Olympia. Great food, Staff and Service. The pizza here is the most delicious that I have had both inside and outside of Italy. The Beef Carpaccio is reason enough to return time and time again and with a good value wine list, and friendly staff, it made a great Birthday dinner venue. I ordered the canelloni and wasn't good. The white sauce was thick (I could take it with a fork), wasn't hot and the taste wasn't so good. The pizza was really nice! I liked it. Lovely restaurant, good food but the pizzas took forever to be served. Worth the wait but could've been quicker. Great food. Lovely friendly staff. I was a bit taken aback that the bill for the five of us came to €180!! Our table was late which I'm sure is not something completely unexpected. To make the wait more palatable - I would suggest offering the folks a glass of Prosecco. I've seen it in other restaurants and I think you'll find a return on this investment. Overall, a wonderful authentic experience. Food and service were exceptional and I look forward to a repeat visit. Saturday night of St Patrick's weekend was probably not the best night to try the restaurant. Formo 500 was highly recommended by our son. However, we ate upstairs where my husband found cold, I was OK. Starters, though dear were very nice. The pizzas were disappointing. The staff didn't engage with us and never asked until we were paying if we were enjoying our meal... Overall a disappointing experience. Easy to make a reservation! Very accommodating to our little one and her needs. Incredible pizza!!! We loved being able to see the pizza being made. Thank you!! It was good but we were a bit ignored initially. Delicious pizza & pasta. Early bird is great value. Easy to book a table online. Staff were very friendly and the pizza was the best I’ve tasted outside of Italy. I love de restaurant, the food, wine, all!! Is amazing!